After a very weak Friday night where the performances from the New york Ranger and New York Islander prospects were suspect at best; Saturday actually had 6 prospects who's efforts merited serious consideration for a star. It was a strange day that began with the OHL being forced to cancel 3 games because of the weather in the Ontario area but ended with some prospects deserving notice. 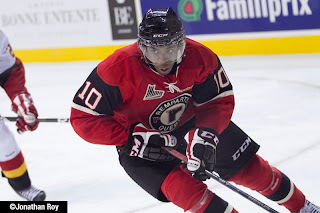 On Monday morning when the QMJHL hands out their 3 stars of the week, the name Anthony Duclair (NYR 2013 3rd) will be mentioned for the 3rd time in the month of January. The Duke followed up a 4 point game on Friday with another 3 point effort (2-1-3) to help lead his Quebec Remparts to a come from behind 8-5 win over Ryan Graves and the Val-d'Or Foreurs. And for the 2nd straight night it was the 3rd period in which Duclair made the plays that snatched victory from defeat especially coming in a game in which Quebec almost gave away. The Remparts gave away two goal leads in the 2nd period going from being up 3-1 and 4-2 to trailing 5-4 in the 3rd period. With the game tied at 5-5, it was Duclair's 41st goal of the season which gave Quebec their final lead of the game on a power play goal at 7:56. It was Duclair's 14th power play goal of the season and it also wound up being Duclair's 7th game winning goal as well. Duclair added his QMJHL leading 42nd goal at 19:08 when he put the game out of reach with Quebec's 8th goal of the game into the empty net. Duclair also added a secondary assist on Quebec's 4th goal of the game to improve overall to 42-32-74. Duclair finished the game with his 2-1-3 on a 5 shot +1 evening. So you take a freshman goalie who has been winless in his previous 7 appearances and ask him to beat Boston College the current 2nd ranked men's college team in the USA. Not to mention that Boston College also has the NCAA's number one offense and that is quite the tall order being asked of Eamon McAdam (NYI 2013 3rd) of the Penn State Nittany Lions. And as much as one wishes to say that the upset of the year in college hockey happened on Saturday night, it did not as Boston College held on for dear life to defeat Penn State 3-2. McAdam put on quite the show in a losing effort stopping 32 out of 35 shots. 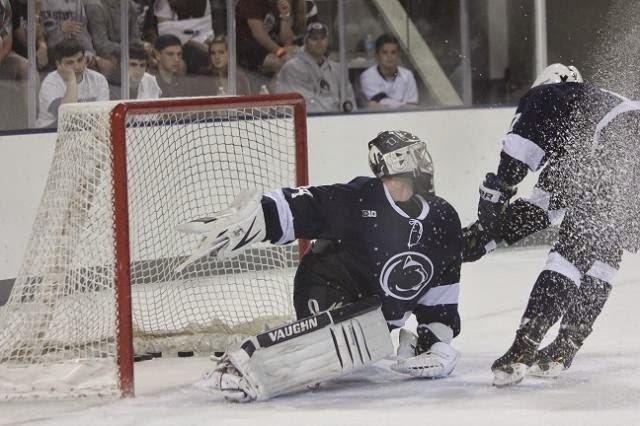 McAdam has played well for a Penn State hockey program that is in just it's 2nd year of existence gave his team exactly what you are hoping in a game in which nobody is giving you even a chance to have a respectable effort. McAdam gave up a goal in each period but he was keeping Penn State in the game and preventing it from becoming a blowout. McAdam was even better during the 3rd period after Penn State had closed the score to 3-2 as Boston College no matter what they tried just couldn't escape Penn State. Call it a moral victory for a 4-15-1 Penn State team. McAdam is 0-8-0, 3.94 goals against and a 0.889 save percentage while earning the game's 3rd star. Mackenzie Skapski (NYR 2013 6th) has found the form that his Kootenay Ice were hoping he would have after winning his 4th straight start helping the Ice earn a 6-2 win over the Moose Jaw Warriors. Skapski gave up 2 early goals but shut the door on the Warriors over the game's final 50 minutes stopping 31 out of 33 shots to help the Ice extend their unbeaten streak to 5 games at 4-0-0-1. Skapski improved to 15-13-2-1, 2.91 goals against with a 0.913 save percentage. Ryan Pulock's (NYI 2013 1st) 15th goal of the season proved to also be the game winning goal as Pulock and the Brandon Wheat Kings rallied from down 3-1 to earn a 6-3 win over the Prince George Cougars. The Wheat Kings are in a dogfight for the WHL's Central Division lead with both the Swift Current Broncos and the Regina Pats remain just a single point behind the Broncos thanks to Pulock. Pulock who also added a secondary assist on Brandon's 5th goal is on a 5 game scoring streak (2-7-9) as Brandon is on a 4-0-1-0 streak during the span. Pulock overall is 15-27-43 for the season. Griffin Reinhart's (NYI 2012 2nd) 3rd goal of the season at 3:55 of the 2nd period wound up being the game winner as Reinhart's Edmonton Oil Kings spanked Adam Tambellini's (NYR 2013 3rd) Calgary Hitmen 7-3 to take over first place in the WHL's Eastern Conference. For Reinhart, the goal was his 1st game winner of the season as he improved to 3-10-13 on the season. Tambellini had an up and down game as he had a 2 point game (1-1-2) but was also a -2 for the game. Tambellini who hails from Edmonton is 3-7-10 in 7 games since leaving North Dakota to join Calgary on January 7th. Loic Leduc (NYI 2012 4th) has a new career high in goals after Leduc's 4th goal of the season tied the game at 1-1 and helped his Rimouski Oceanic earn a 2-1 shootout win over the Drummondville Voltigeurs. Leduc who also tied a career high with his 10th point of the season is now 4-6-10 as Rimouski remained 3 points behind the QMJHL leaders the Baie-Comeau Drakkar. Ryan Graves (NYR 2013 4th) had the primary assist on his Val-d 'Or Foreurs 3rd goal in their loss to the Quebec Remparts 8-5. Graves recorded his 1st point as a member of the Foreurs also had 6 shots on goal. Brady Skjei (NYR 2012 1st) had a rare off night at the defensive end winding up caught on the ice for 3 goals against as his Top Ranked Minnesota Golden Gophers played to a 4-4 tie with the Minnesota Duluth Bulldogs in the North Star's College Cup (Minnesota wins tournament thanks to 2-0 win in shootout. Skeji along with Jake Bischoff (NYI 2012 6th) and Taylor Cammarata (NYI 2013 3rd) were all held scoreless. Victor Crus Rydberg (NYI 2013 5th) was scoreless as his Plymouth Whalers were spanked by the Sarnia Sting 6-2. The Whalers dropped their 2nd straight game. Doyle Somerby (NYI 2012 5th) was scoreless and a -2 as his Boston University Terriers were spanked 6-2 by Vermont. Steven Fogarty (NYR 2011 3rd) was held scoreless on just 2 shots as his 15th ranked Notre Dame Fighting Irish returned the shutout favor as they shut out Vermont 3-0 to earn a split of their weekend series. Stephon Williams (NYI 2013 4th) got the start in goal for Minnesota State but for the 2nd straight start failed to last the entire game. Williams was yanked after giving up 5 goals on 15 shots as Minnesota State lost to St. Cloud State 6-4. Williams is 4-6 with a 3.59 goals against and a 0.856 save percentage. Kyle Burroughs (NYI 2013 7th) missed his 2nd straight game due to some minor injury issues.